I'm building a database to store student exam results so that transcripts can automatically generated. This is a final year project for university so the database will never be used. I am a complete amateur when it comes to designing databases. I have attached the relational schema for the database. I'd be grateful if someone who knows about proper design could tell me if its ok (from the point of view referential integrity and normalization etc). I'd really appreciate helpful comments. 1) In the OverallMarks table, MarkType refers to whether the overall mark (i.e. 1st honours, 2nd honours) is for JF (Junior Freshman), SF(Senior Freshman) and so on. 2) In the ExamResults table, YearOfStudy refers to JF, SF, JS or SS. Year refers to the actual year the exam was sat e.g. 2007. 3) The data in the database will be coming from Excel spreadsheets, so my database will not be doing any calculations on the data. That's why I'm storing the overall mark instead of calculating it from the ExamResults table. First off, the only two tables that are in any sort of normal form are Students and Subjects. 2) Stick a primary key on everytable, even if you don't think you need one. For the tables that don't already have one an identity column should do. 3) I would make sure that every row in the OverallMarks table is for a year in which the student actually took a class. In sql, you could do this via a trigger or by denying insert/update access to the users and forcing them to use a stored procedure instead. you can't use checks because you're referencing another table, so it will be expensive one way or the other. perhaps it would be better done in the interface if you are not worried about bandwidth. The data is small so bandwidth shouldn't be to big a deal. If you take this route i would most surely slap an index on the StudentID column of of the StudentClasses table to speed it up. You have a one-to-many relationship between StudentSubject and ExamResults. Is that a true representation of life, in other words can one student, for one subject, have more than one exam result (mid-term, finals, etc.)? If yes (which I suspect), the ExamResults table needs one more bit of info about which exam this is. 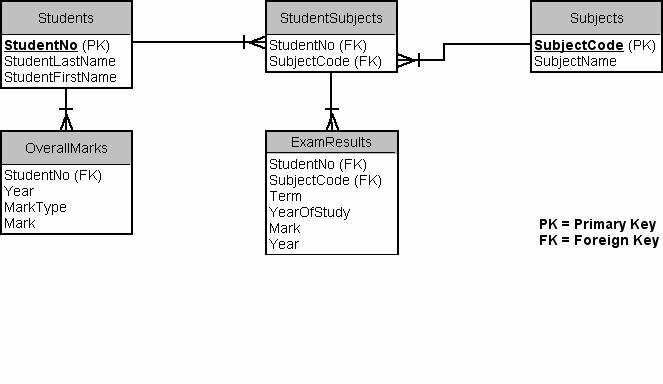 You could 1) add an ExamNo field in it; 2) add a table Exam with an ExamCode PK, and then an ExamCode FK field in ExamResults; 3) add an ExamDate field in ExamResults. Personally I would go for option 2 and list all possible exams in that school with fields like: ExamCode (PK), SubjectCode (FK), ExamDate, Building, Classroom, etc. In any case, I agree with Aaron's suggestions above: remove StudentSubject table and replace with the modified ExamResults, make sure every table has a PK, and reinforce your constraints. Sabatier, could you please post a new pic of your diagram (that is if you updated it with all the suggestions). I'm working on something similar in my class. Thanks bud. Database Design - Healthcare App with many roles. How should I approach it?